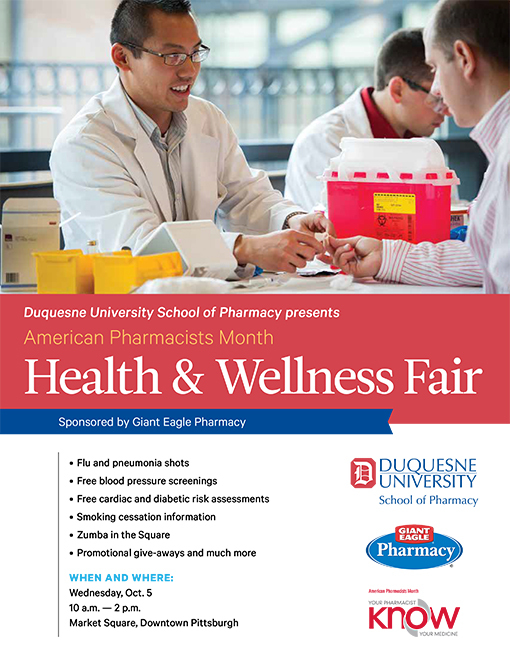 In celebration of American Pharmacists Month, the Duquesne University School of Pharmacy is offering seasonal immunizations, complimentary health care screenings and educational outreach to the community as part of its fourth annual Health and Wellness Fair. Nearly 100 faculty and student pharmacists representing more than 15 professional pharmacy student organizations will offer 25 distinct outreach services and activities at the Health and Wellness Fair from 10 a.m. to 2 p.m. on Wednesday, Oct. 5, in Pittsburgh's Market Square. "Improving health outcomes of patients and their communities is part of the mission of the School of Pharmacy," said Dr. Janet Astle, assistant dean for student services in the pharmacy school. "The Health and Wellness Fair helps us to fulfill this mission by meeting patients where they are. As a result of this direct engagement, our faculty and student pharmacists can work hand-in-hand with the community to create a healthier Pittsburgh." The Health and Wellness Fair is sponsored by Giant Eagle Pharmacy. For more information, contact Astle at astle@duq.edu or 412.396.4354.